At Hamza Clinic, Dr. Asif Siddiqi is available who is a general practitioner and specialist in Family Medicine. Hamza Clinic is located in Karachi Company G9 Markaz, Islamabad. 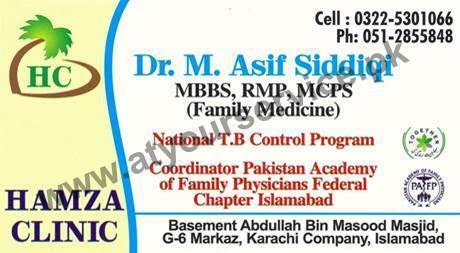 Dr. Asif Siddiqi is available at this clinic. He is a general practitioner and specialist in Family Medicine.